Twenty miles across the English channel, I went to work everyday and spoke with teenage girls who woke up with tear gas in their eyes, police boots in their ribs. 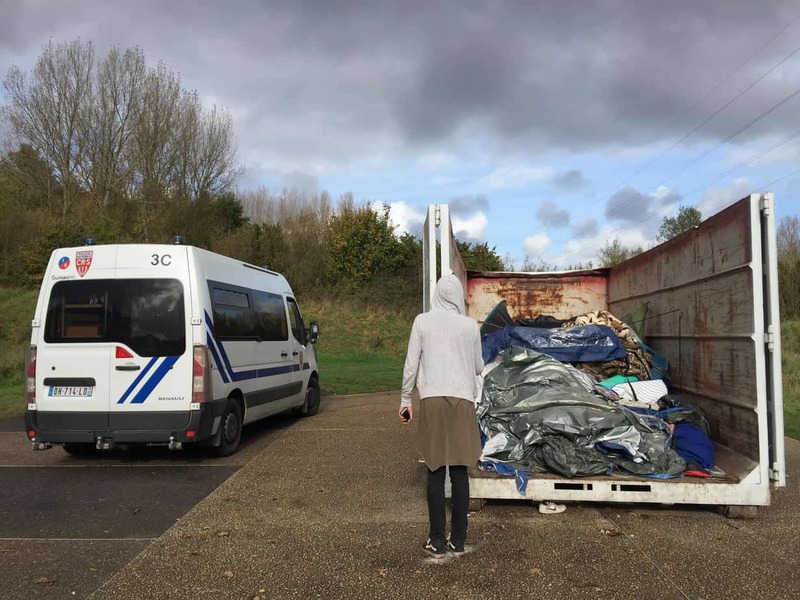 On the outskirts of the grey, suburban neighborhoods of Dunkirk and Calais, police soak donated sleeping bags and tarpaulin in tear gas concoctions, rendering them useless. 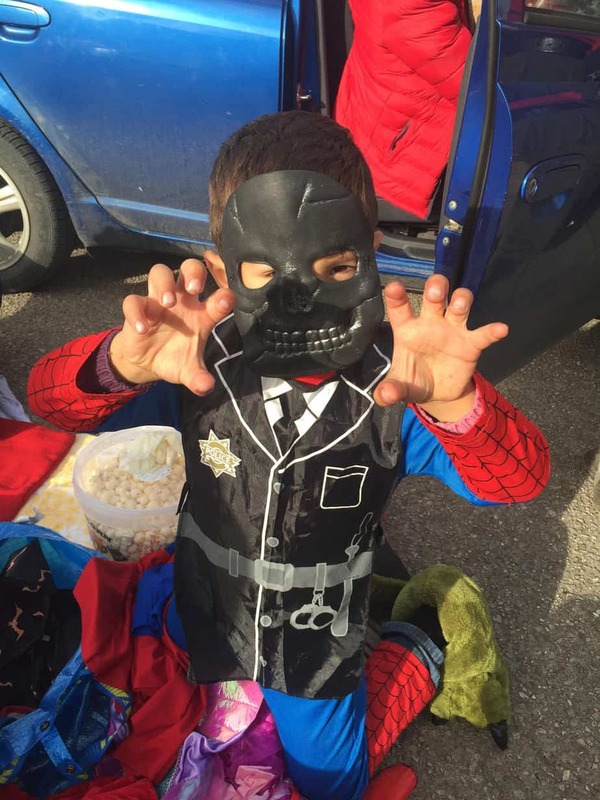 Children sell their bodies so they can pay for a way to meet family across the channel. The first cases of trenchfoot since World War One are running rampant. It sounds like a dystopian reality, but it’s not, and it’s here. 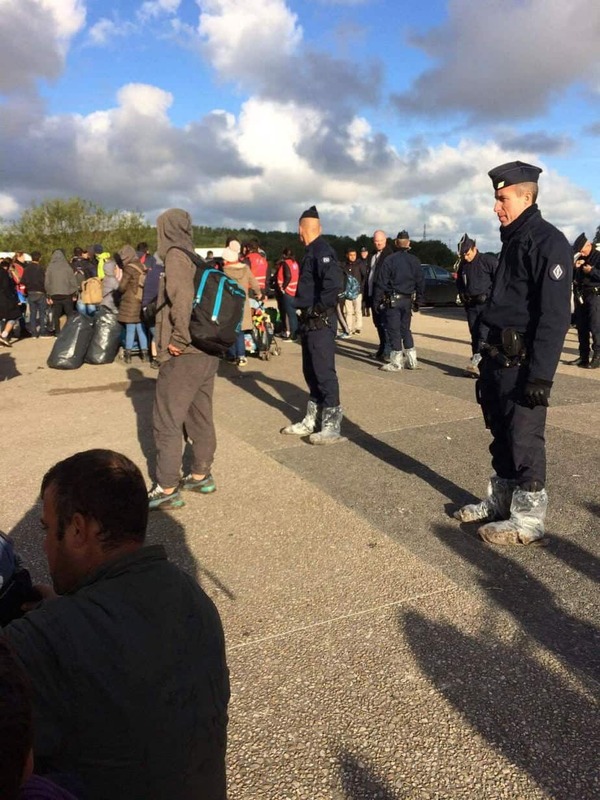 I could go on explaining the police intimidation and horrific conditions that make up life for refugees in Northern France right now (and this is a good post if that’s what you want to read) – but something would be missing. The actual refugees. The police take all of the tarps, tents, and plastic and destroy them. When we asked for them back as they were our property, the police call them “garbage” – a refugee’s home and only protection from the elements is garbage to them. They are not my stories to tell. Even if a refugee consents to sharing their story, photos, etc. online, sharing it still increases risk, particularly for those who are fleeing from smugglers, political persecution, or are specifically being looked for. 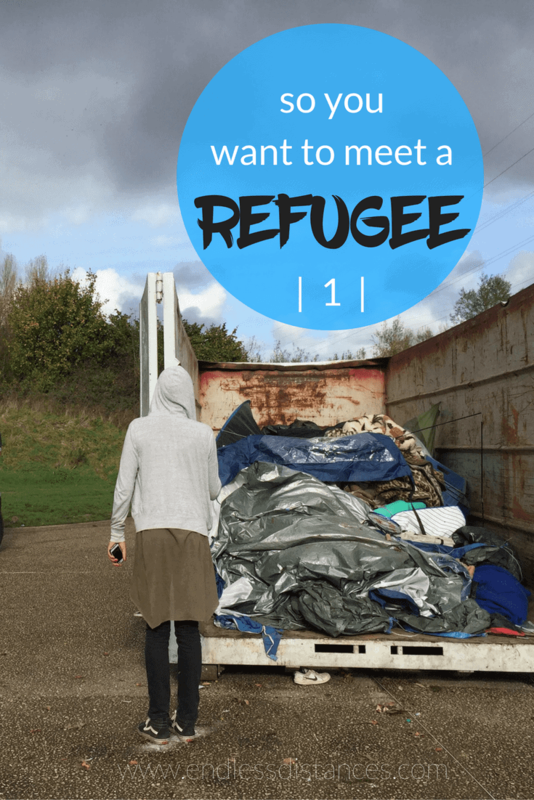 Asking a refugee to relay their story in depth can be traumatic. Many suffer from PTSD and dredging up these memories can create flashbacks, panic attacks, and more. It is, in my opinion, irresponsible to do so when there are not adequate mental health support groups operating on the ground. And finally, my own struggle with the question: Why do people need to read about someone’s most personal traumas in order to be driven to do something? That last question, particularly, is difficult to answer. I think the answer lies somewhere along the same vein as the answer to why people read blogs. There is something humanly satisfying about reading someone else’s innermost experiences, and finding a connection to that. So, I’ve been playing that question over in my mind, and here’s what I’ve come up with. She is Kurdish Iraqi, like the majority of people living in the forest in Dunkirk. We meet over a burned out fire by her green plastic tent on a hot September day. I’m collecting orders for our distribution the next day. “Sarah,” Gilya calls sheepishly, with the rolled “R” I’m used to by now. I’ve already taken her order – new shoes, her trainers have holes in the sole of one shoe from her heavy limp, and the water gets in putting her at risk of trenchfoot. “Sarah, do you have purse?” Gilya blushes, looks down. “Purse?” I ask. I look at the mud surrounding us, the heavy stench of burning plastic and the “toilet” just a few trees over. It takes a second to even register the word in these conditions. “I’m going to Paris,” she quickly explains, “to see my friend, she sought asylum in France. I don’t need much, you know. I have everything I need. But. I want to look nice, for my friend? I have only suitcase,” she points to a mud stained plastic suitcase with a broken zipper, lying inside her tent, the cast-off of a German donation transport. “Only if you have. Inshallah. Purse,” she says, as she can see me begin to make excuses. Our supplies are running low, and the Women’s Centre is frantic for blankets and hygiene supplies, forget purses. “I’ll see what I can do. Inshallah, purse” I wink at Gilya and although she laughs, it doesn’t quite meet her eyes. In disaster zones, you are supposed to follow Maslow’s Hierarchy of Needs: provide items necessary for survival. Gilya can survive without a purse, but she will feel less human for it. The next day I am in the warehouse, with a spare five minutes I dig into a pile of scarves, hats, gloves, and there, at the bottom, a bent, but still functioning, purse. I tuck it into the bin bag labeled “Gilya” with her trainers. And then, a few days later, I am on the train back to England, the morning of the massive and forced camp eviction. Gilya, who is not only a vulnerable woman with a physical disability, also has thyroid cancer and was receiving treatment. Now, she will be dispersed across France without any information, perhaps over 17 hours away, and somehow expected to get back to Dunkirk. As horrible as that is, horrible things like that happen every day in the jungle. What hurts the most is the thought of her hopeful eyes as she held the purse. Her weekend in Paris, seeing her friend, gone, along with, quite possibly, her chance at life. We meet in the car park, he has a mustache and beard but his eyes are big and young – Arhat is only fourteen. I’m holding a thick book titled Monster Stories that I’ve pulled out of our activities box in the spirit of Halloween. I stare at the page, wondering whether I should go for it or if it will just be ridiculous, to read this storybook aloud to the Kurdish children sitting in front of me, none of whom speak any English. Arhat comes and sits over my shoulder, I can tell he senses my predicament. He points to the page and says “Dinosaur.” Where he points, there is the purple figure of a T-Rex. “Good,” I say. I point to another figure and say, “Girl.” Arhat repeats in faltering English, “Gull.” “Close,” I reply, pointing again to another figure, “Boy.” Arhat nods, points to himself excitedly, “Boy” he repeats. As we continue, a few women come over, joining in the impromptu English lesson. Soon they are trading me Kurdish words for English ones, and an hour has passed sitting in the car park with this colorful book of Monsters. As we pack up to leave, I ask Arhat where he stays, and his eyes grow dark. He points North, along the river. “No Daiya,” he says. No mother. No father either. He sleeps with another family for protection, as many of the unaccompanied minors do. “See you tomorrow then,” I say, shaking his hand. “No. Bayani dat bin moa” Arhat instructs in Kurdish, laughing. “Bayani dat bin moa,” I agree, thinking how useful this phrase will be. At home a few hours later it hits me: tomorrow is my day off. I sigh in annoyance, I hate letting people down, but Arhat will be fine as he can do activities with the other women tomorrow. I’ll see him the day after. The next day, when the other women come home, Lucy says to me, “You know Arhat? I’m worried about him, he really is all alone.” I nod in agreement, relaying our English lesson from the day before. Lucy nods along, “You know, today I asked him who his friends are in the jungle, and all he said was ‘Sarah America’!” We both laugh, and I am touched by this sweet boy, touched that our little English class meant so much to him. But there is, as always here, a darker side to it: This unaccompanied child has lived in the jungle for weeks, yet by speaking to him for just one day I have become his closest friend. That is not right. And, despite asking after him every day, it is the last we ever see of Arhat. 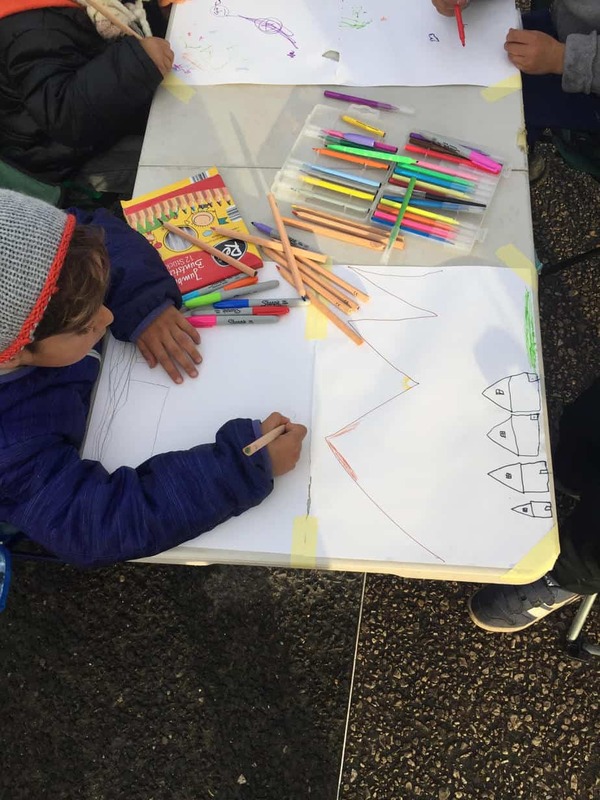 refugee children drawing homes… what would be a normal drawing for a normal kid is but a dream for these children. Buy your holiday gifts from our BRAND NEW fundraiser! I have spent all week designing merchandise, which we are selling during the holiday season. ALL proceeds go directly toward providing our seven day a week support to the women and vulnerable refugees in France. 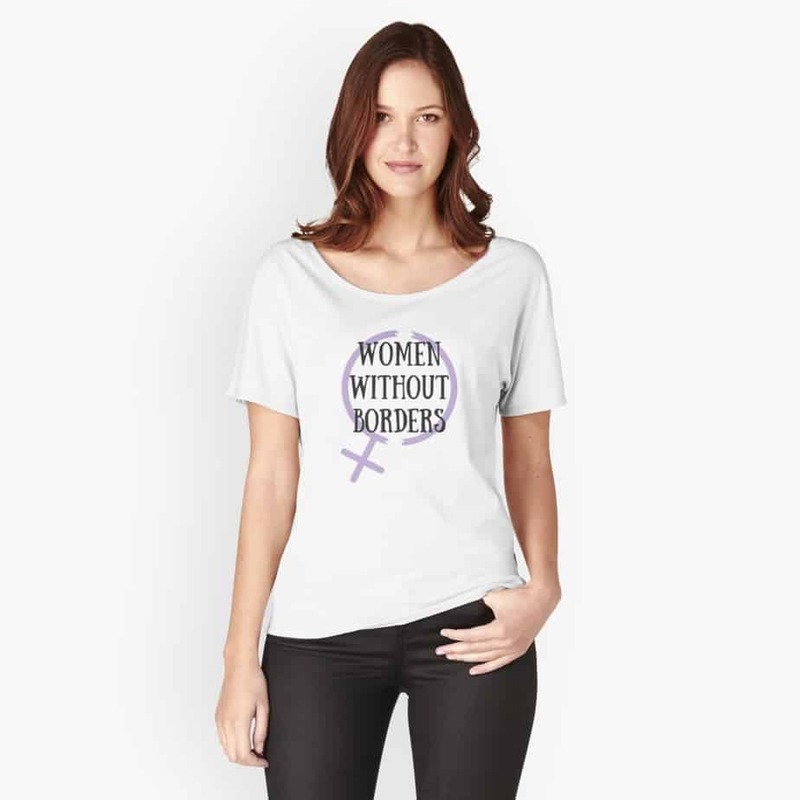 I think it’s a particularly great slogan for travelers: WOMEN WITHOUT BORDERS. If you want to donate to the Dunkirk Refugee Women’s Centre directly, you can do so here. Now I’m turning it back to you guys… what will you do to help refugees? INTERNATIONAL WOMEN’S DAY | Help me Help Refugee Women!